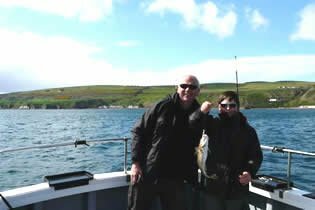 The boat was out and today's top fishers were father and son, Tony and Paul. Both were blessed with the weather and the fishing wasn't half bad. Many thanks to Tony and Paul. Dad caught the most, but the young pretender managed to take the biggest. Only just though, with a very nice cod of around 4/5lbs, as can be seen in the photo. Today started with thick fog that threatened to stop play before it started but, thanks to modern marine electronics and experience, off we set albeit slowly. After trying a few marks with some fish showing, the fog began to lift and so did spirits as the fish started to come on the feed. Father and son Paul and Finn had a great trip catching 20 plus fish between them. Photos of the trip show a very happy 11 year old Finn. Well done Finn, but not forgetting dad, too! Nice bright day, although vicious, strong westerly blowing. Left harbour around 8 am, fishing by 8.45 am on the bottom of the tide. Fishing started quite slowly, but after two or three moves trying to locate the fish, we started to strike gold. The guys were all fishing basically the same, feather rigs of one sort or another, tipped with frozen prawns. Codling started coming on the boat in good numbers along with ling, coalfish, pollock, and even an under-sized flatty which, along with several other fish were returned unharmed as it became apparent that I managed to find the fish and the next few hours proved that, by over 30 fish coming on board. The biggest surprise being the first mackerel of the season, albeit only two in number. 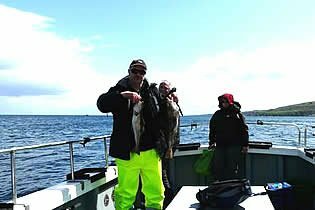 They were the usual large variety that we tend to catch in Scotland - fish of around 1.75 lbs. The largest cod - 6+ lbs. 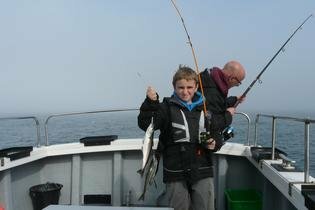 I was very pleased to have another father/son combination on board and even more pleased with young Max's performance easily keeping up with the adults on board. Well done Dad, Pete and son Max!